Axeroni Pickaxe in Fortnite BR. Looks like a pizza cutter. You can buy this harvesting tool from the Item Shop for 800 vbucks. 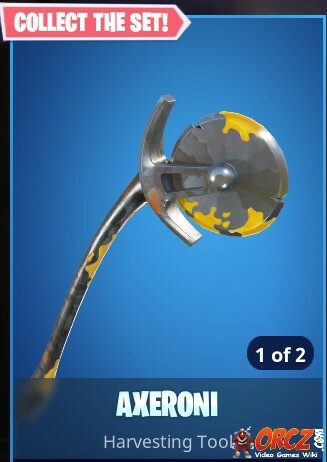 Axeroni is the name of one of the Pickaxe Skins in Fortnite Battle Royale. Looks like a pizza slicer. First appearance of this pizza knife pickaxe was in the featured section of the store on April 22nd, 2018. This page was last modified on 23 June 2018, at 11:17. Content is available under Creative Commons Attribution Non-Commercial Share Alike unless otherwise noted.